The popular Brazilian aerobic exercise program that mixes Latin music and international dance steps comes to the world of games for the first time in Zumba Fitness. Players can tone their muscles and build strength and endurance as they practice nine different hip-swaying dance styles, including Reggaeton, Merengue, Salsa, and Flamenco. There are 30 different music tracks, each corresponding to a unique dance routine, and the lessons are led by popular instructors Tanya Beardsley, Gina Grant, and Zumba creator Beto. 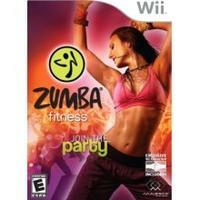 Zumba Fitness comes with a special belt that lets gamers holster their Wii Remote for hands-free dancing as they follow the onscreen instructor's routine. There are a number of different dance venues, including a gym, a night club, and the roof of a skyscraper, and as players hone their skills, the stage transforms into a more lively and dynamic party. Four different difficulty levels cater to dancers of all skills, and multiplayer fans can join up to three friends for co-op dancing or competitive action in the "Zumba Attack!" mode.